The radiation oncology community can benefit from standardized nomenclatures applied to targets, normal tissue structures, and treatment planning concepts and metrics. Such conformity enhances safety and quality efforts within and between clinics for routine ongoing practice, and it enables data pooling for outcomes research, registries, and clinical trials. Standardization is a vital precursor to the development of scalable uses of scripting for quality assurance and treatment plan evaluation3,22,23. Increased clarity and consistency through standardizing nomenclatures in these areas would provide broad benefits. 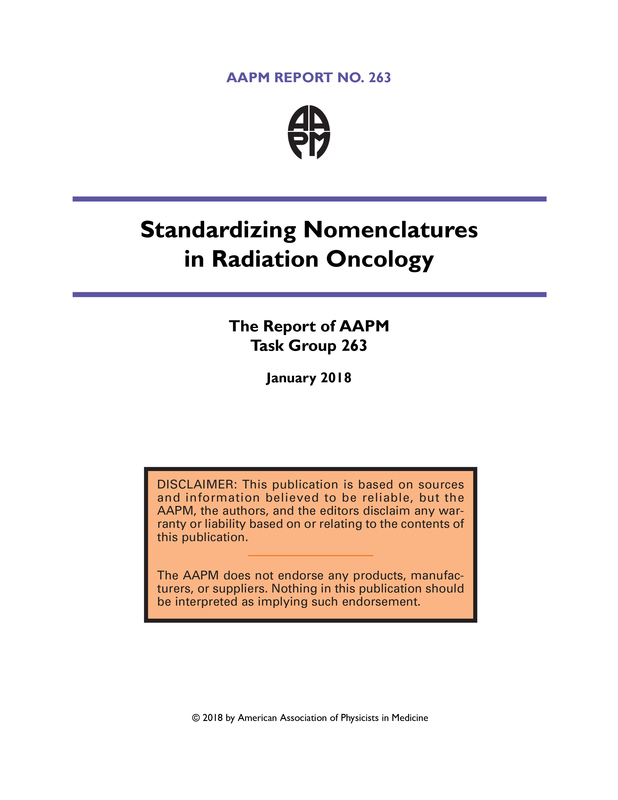 The charge of AAPM Task Group 263 is to provide nomenclature guidelines in radiation oncology for use in clinical trials, data-pooling initiatives, population-based studies, and routine clinical care by standardizing: 1. structure names across image processing and treatment planning system platforms; 2. nomenclature for dosimetric data (e.g., dose/volume histogram [DVH]-based metrics); 3. templates for clinical trial groups and users of an initial subset of software platforms to facilitate adoption of the standards; and 4. formalism for nomenclature schema which can accommodate the addition of other structures defined in the future.